Read my review on New York Journal of Books first. Additional remarks that appeared in a different and now defunct publication begin with the next paragraph.Russ Rymer's third book and first fiction book Paris Twilight, published today by Boston and New York publisher Houghton-Mifflin Harcourt, is written in the kind of dense poetic prose I adore and devour the way a glutton consumes a half gallon of ice-cream. In my New York Journal of Books review I describes the novel as “. . . narrated in gorgeous, elegiac prose . . . a very enjoyable and strongly recommended read. . . . deserves to be nominated in the fiction category of book prize competitions.”Its plot unfolds in Paris, France in 1990 during the weeks and months leading up to the first Gulf War, but there are flashbacks to Spain in the final months of the Spanish Civil War, Paris under German occupation in World War II, and New York in 1963. The 1942 section describes the deportation of Jewish foreign nationals at the outset of the Shoah in France (Jewish French nationals were not deported until 1944), and disclosed a detail of that history that was new to me.When the French police, following German orders, began arresting foreign Jews there was a difference of opinion regarding how to deport them to the death camps in Poland and Germany. The Gestapo wanted to deport the parents first, and the children some months later, to preserve the illusion that the parents were being sent to work camps. The French Vichy government believed that separating parents from children would create more indignation among the French populace than deporting families together.The Germans initially ignored the advice of their French collaborators, and the children were temporarily housed in overcrowded barracks in a Paris sports facility with insufficient food, water, beds, blankets, bathrooms, and adult supervision. Paris Twilight's only Jewish character passes as an Aryan German Paris resident and gets himself hired by the Gestapo as a photographer so that he could document the conditions in the children's transit camp.But most of the narrative takes place in 1990 Paris and touches on eros, agape, ethics, philosophy, and medical science. The voice of Mr. Rymer's woman narrator is thoroughly and convincingly female, an impressive feat for a male author. Read the two excerpts from the novel in my New York Journal of Books review and see if you share my enthusiasm for Mr. Rymer's prose style. 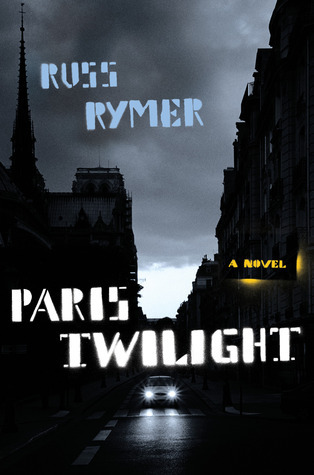 Russ Rymer's debut novel, "Paris Twilight," is the story of anesthesiologist Matilde Anselm, who is brought to Paris to be part of a special medical team. The lead surgeon is a former colleague and lover, Willem, who is being very secretive about the procedure in which they will be involved.In the mean while, Matilde is contacted by a Parisian lawyer to let her know that she has inherited an apartment in the 7th Arrondissement ... from a man of whom she has never heard. Eager to dispose of her inheritance, Matilde visits the tiny apartment so that she may evaluate it ... and is soon brought into political intrigues both present and past.Set against the backdrop of the first Gulf War, Rymer brings us into a Paris that is torn by war protests ... and in which no one Matilde meets is quite what they seem. Rymer clearly knows Paris well; I could see each street as he described Matilde's travels, having been to Paris myself. It is these little details and touches that make the story feel so real for the reader.This book is a politico-medical thriller, which is an interesting genre juxtaposition. Suffice it to say that I didn't want to put the book down; I read it over the course of a day and a half. There are so many complications that to further describe the plot is to deliver spoilers.Highly recommended. I just finished Paris Twilight. I basically read it cover to cover, and I absolutely loved it. It is such a smart and emotional book. The poetry of linking the Spanish Civil War with the Gulf War and the artful way Rymer threads together diverse narratives is amazing. I found myself so deeply moved by the humanity of the book; in a literary scene that is dominated by distopias, darkness and cruelty, the book is so positive. It has such a beautiful and deep message about the human capacity for love, sacrifice and forgiveness. For passion and for purpose and for fighting the right kind of fight in a world where the lines between good and evil have become so blurred. A soulful book. Having a hard time with this one. Very densely written but interesting plot, just taking a long time to get on with it. I could not stop reading this book. Paris Twilight is so beautifully written, both artistic and poetic at the same time. The author is incredibly gifted in the way he intertwines the different stories together and brings together the themes of love, sacrifice and ultimately forgiveness. "For I know why we must try so hard to live. And why we must not live too long, for we mustn't tire love. For love will outlast us, however long it takes . . ."
Struggled to finish this book. Novel attempt from journalist. Was previously totally engrossed in Genie: Rymer's book about Genie (pseudonym) for feral child born 1957. My obsessive need to finish every book I start makes me wonder about other's views on this book. This book is one of those that grabs you and holds on to you until the very end. I am an avid fiction reader, and what I most enjoy in a good work of fiction is something that gives that rare experience of feeling that you are actually inside the world of the book. Paris Twilight does that, and more.At one point, I was so immersed in the book that when I had to put it down to head out to run some errands, I grabbed an umbrella on my way out the door. It was only once I was downstairs on the sidewalk that I realized it was completely beautiful weather outside--it was in Paris Twilight where rain was falling!But it's more than just the mood and the immersion that captivated me. The thing about this book is that it grabs you and delights you on every level:* The plot is intricately woven such that its complications do not distract from the pull of the story, but rather enhance it. And the mysteries are unfolded in such a way that I didn't feel it was about guessing or "figuring out" what was happening, but more about experiencing it. * The characters are distinct, memorable, and compelling, without become caricatures. Each has his or her own voice in the story, and Matilde as the narrator and central character, reveals them to the reader as she herself discovers who they are. * The settings are so richly described, that I felt I was there. Details about mood, sights, smells, sounds, and weather (see above!) create a sense of immersion into this novel's universe. * The science is credible and engaging. The writing doesn't shy away from its complexity, tying it closely to the characters' own complexity so that regardless of your own level of understanding, its presence makes sense. * And then, my personal favorite--the sentences. Russ Rymer's sentences are beautiful works of art. Over and over again, I found myself relishing their structure, and their pure musicality. There are many, many paragraphs where the rhythm of the writing alone gave me goosebumps.I would say more about the plot, but I don't want to give anything away. What I can say is that you will not regret reading this book. I received an advanced copy from Elle magazine for review.The novel was extremely wordy, and while this made it it a bit difficult to read in the beginning of the book, I grew to love how descriptive this story was. Russ Rymer writes from the point of view of a woman so well, it astounded me. It is extremely difficult to classify this book into one genre. It's a love story, one of old love and love, but also deals with the elements of family and what one would do to save the life of the ones they love. It is also a political thriller, hitting on the First Gulf War as well as going back to the Spanish Civil War through a collection of old love letters. On top of the beautifully written story, there are two surprise twists at the end of the story, making it all the more intriguing. I can usually read a 400 page book in a day if I really get into it, maybe two, but this one took me two weeks or so to read and it's only 296 pages. I kept falling asleep whenever I'd try to make some headway with it and it's because you have pages of flowery prose to describe the way things look that turns you in circles until you realize you've lost your way and can't remember half of what you just read so you have to read it all again. I'm a straightforward type person, just tell me and get on with it. It also bounces around in weird ways and characters come out of nowhere or they're so minor that when they come around again you've forgotten who they are and what their purpose is so you just shrug and keep going. I also had all the "mysteries" pegged pretty quickly and wasn't surprised by anything that happened. This novel reveals family secrets that had been hidden since World War II. The story unfolds slowly through the translation of letters from from an imprisoned wife and mother to her husband during wartime, and the discovery, 45 years later of a woman's past related to the events that were described in the letters. The plot and outcome instruct the subtleties of life's mysteries, including love, brief happiness, success, failure, tragedy and dissapointments. The difficult lessons ultimately impart hope and understanding necessary to accept loss and to rekindle the desire to move forward through life. Matilde Anselm is in France to collaborate on a mysterious surgical case. While waiting for the transplant match, she discovers that she has been named executor of the estate of Byron Saxe. Since Anselm was adopted she wonders whether Saxe was a lost relative. In uncovering the mysteries of Saxe and her soon-to-be patient, Anselm learns more about herself and achieves a modicum of closure about the passing of her beloved, Daniel. *Rymer is able to combine lyricism with medicine and politics. The book is both engaging and thoughtful. *Read Paris Twilight to experience exquisite writing and an original story line. This book fascinated me by combining a "medical thriller" with past political/war event and current events. I also liked that there were words I had to look up, forced me to read slower to take it all in. Wow. I wish I could give this 10 stars. This might be my favorite book of all time. So well written. Great vocabulary and fantastic story that is cleverly told in a non-overt way. Plus it takes place in Paris and has plenty of French vocal and phrases peppered throughout. A beautifully written and captivating book. Rymer leads us through the streets and suites of Paris to unravel an enigmatic tale of medicine, morality and a tangled heart. His poetically crafted prose shines whether the scene is science or seduction. This is your summer read. Quit....didn't enjoy the story or the writer's style. Sorry, I couldn't even finish this book. Quit on page 70. It's not compelling and certainly not fast moving. Too detailed in places that doesn't move the story along. Russ Rymer - Russ Rymer is the author of Genie: A Scientific Tragedy, which became a NOVA television documentary and was a finalist for a National Book Critics Circle Award, and American Beach: A Saga of Race, Wealth, and Memory, which was nominated for a Los Angeles Times Book of the Year Award and named a New York Times Notable Book. Rymer, currently the Joan Leiman Jacobson Non-Fiction Writer in Residence at Smith College, has contributed articles to The New Yorker, National Geographic, Harper’s, Atlantic, and the New York Times Magazine.